If you are looking into getting a Hybrid, one of the motivations is probably getting fuel costs down along with wanting to leave less of an impact on the environment. But does getting a hybrid have to mean sacrificing on space and power. What if you could get it all? Take a look at the 2017 Sonata Hybrid and see that you can. 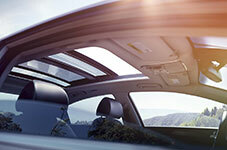 The Hyundai engineers have made the large hybrid battery more compact, which means more room for you. The compact battery is placed below the trunk rather than inside it to provide a flat storage space that mimics the trunk space of a traditional sedan. 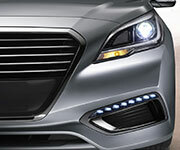 This compact design and placement is what gives the Sonata Hybrid its best-in-class passenger and cargo volume status. With 106.1 cubic-feet of passenger volume, you and up to four passengers can ride in comfort. Even with its compact design, the Sonata Hybrid battery has the largest battery capacity in its class. The class leading capacity also provides for a class leading all electric range. With an all-electric range that is more than double the average commute, you can drive your Sonata Hybrid to work and back every day without ever using a gallon. The combined range for the Sonata Hybrid is 590 miles. That means you can go on your summer road trip without having to fill up or charge up before you get there. All the technology isn't just confined to the engine though. There's plenty more to use. In addition to the Hybrid technology and regenerative braking Apple Car Play and Android Auto let you connect your car and your phone. Through the touch screen you can run your phone's apps so you can use your phone's GPS, run your music playlists, reserve your movie tickets, and so much more. 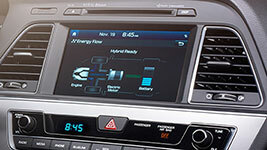 MyHyundai with Bluelink connects your car and phone even when you're not in it. With this feature you can lock and unlock your car, check diagnostics, or start your car before you get there. That way, you can make sure it's the right temperature right when you get in. Saving money on gas, having best-in-class mileage and passenger volume, and awesome connectivity are great. One of the best parts about buying a Hyundai is that they come with America's Best Warranty. 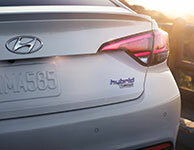 Hyundai nearly doubles the standard new car warranty and covers you for 5 years or 60,000 miles. The powertrain warranty lasts for a whopping 10 years or 100,000 miles. Hyundai also provides a lifetime warranty for its hybrid battery. This kind of coverage makes deciding to buy a new Hyundai a little easier. If best in class mileage and space, along with technology isn't enough, you might need to go for the Limited version. The Sonata Hybrid Limited comes with leather, ventilated front seats. This gives you the comfort of leather without the added heat. Smart cruise control automatically senses differing traffic speeds and slows down to keep a safe distance all the way to a full stop if necessary. When traffic picks back up, your car will too all the way up to your set speed. This plus forward collision and lane departure warning, and a power sunroof, give you the ultimate in style, comfort, and safety. Bring the outdoors in with the push of a button. Access your phone's apps and contacts without taking your eyes off the road. Daytime running lights ups the ante on safety, keeping you visible to other drivers. Don't be surprised by something darting out behind you, with sensors that alert you. Hybrids are great for saving gas and for helping out with the environment, but not all hybrids are created equal. If you want the best mileage and space to spare, you need to get a 2017 Hyundai Sonata Hybrid.